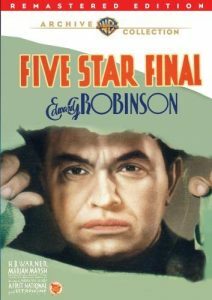 Five Star Final is a film that stands out primarily due to a great performance by Edward G. Robinson, who plays the part of newspaper editor Joe Randall, who is being pressured by his boss to increase the news circulation by running some sensationalistic news stories. Against his better judgement, he does so — and digs out the decades-old story of a convicted murderess, Nancy Voorhees (played well by Frances Starr) — the murder was actually a justifiable homicide, but that doesn’t sell newspapers. In the intervening time, Voorhees has lived quietly, married and changed her last name, and raised a daughter — who is about to be married. An unscrupulous, unlikable, alcoholic reporter for the newspaper, Isopod (played disgustingly well by Boris Karloff) follows a lead to the home of the happy family, pretends to be a minister, and leaves with a photo of the daughter — that becomes the headline the following day, “Daughter of Voorhees killer to wed.” Nancy tries to hide the news, but the newspaper is uncaring — and Nancy commits suicide, in a side room, outside of the audience’s view. Her husband, Michael Townsend (played very well, getting the audience’s empathy and sympathy, by H.B. 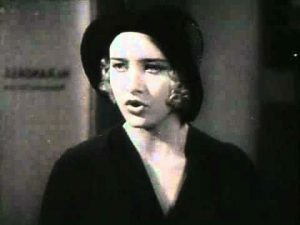 Warner) tries to hide both the news of her mother’s identity, and death, from his daughter Jenny (Marian Marsh) and future son-in-law — but the young man’s parents find out, and order their son to cancel the wedding, or be disinherited. To his credit, he stands by his fiancee. In addition, the father is unable to live with his wife’s death, and also commits suicide; causing all of the characters to examine their hurt, culpability, and future — leading to the daughter, Jenny, confronting the newspaper staff with a gun, and threatening to take revenge for her mother’s death. Her fiancee talks her out of it, and the grieving young couple leaves. Five Star Finale ends with an excellent confrontation in Edgar G. Robinson’s office with his publisher. Joseph W. Randall (Edward G. Robinson): Now you listen to me, Hinchecliffe. It’ll be for the last time. I’m through with your dirty rag, and I’m through with you. Oh, I’m not ducking any of the blame for this thing. You thought of the murder and I committed it. But I did it for smaller profit. For wages. You did for circulation. Bernard Hinchecliffe (Oscar Apfel): You must be mad. 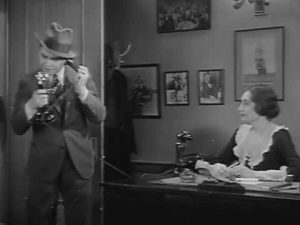 Joseph W. Randall (Edward G. Robinson): Mad. Yes I am. All my life I’ll be mad. Because all my life I’ll be seeing Nancy Voorhee’s daughter standing there. And asking me why I killed her mother. And I want you, Hinchecliffe, to enjoy the picture with me. I want you to wake up in the night and see your own squashed, putrid little soul. I want you know that every human being that works for you knows what a diseased hypocrite you are. We all know what you are! But we take your money and do your work, because we’re afraid to starve. You’ll have my resignation and release of my contact on your desk immediately. In short, Five Star Final is highly recommended. Early in this brisk dramedy, a jaded newsman laments that some reporters furnish the manure while some grow the flowers. Editor Joe Randall’s newspaper is suddenly in the manure biz. To increase readership and revenues, he’s pressured against his principles to come up with a sensationalist tale or two. So Randall revisits a love-nest murder of years past. Circulation soars. But living people – real people – involved in the story are suddenly victimized. Randall could never imagine the tragedy to follow. As Randall, Edward G. Robinson finds a role to match his authoritative talents in this hot-off-the-presses Best Picture Academy Award nominee* directed for hard-hitting effect by Mervyn LeRoy. Boris Karloff, just weeks away from the release of Frankenstein, plays Randall’s shady lead reporter.